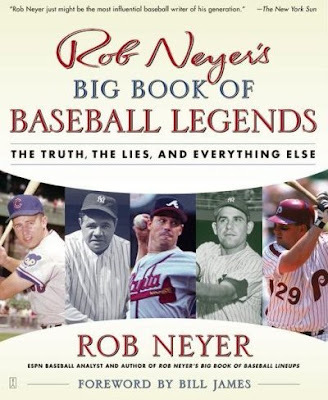 The latest release from Rob Neyer , Rob Neyer’s Big Book of Baseball Legends: The Truth, the Lies, and Everything Else , follows in several of his traditions, but also explores some new ground. This is the third “Rob Neyer’s Big Book of…Something” though alas, he opted not to go with my suggestion of “Bubblegum” for the subject of his next work. Perhaps that’s still to come. More important, Rob keeps with his traditions of seemingly endless and in-depth research, sharp, focused writing and an interesting subject matter. As its title suggests, this book explores some of the legends of baseball history that we may have heard through the years. Babe Ruth’s famous “Called Shot” in the 1932 World Series against the Cubs is perhaps the biggest of them, but many and varied are the legends in this book, and they range from the commonplace to the obscure. Most of us know about the rivalry between Carlton Fisk and Thurman Munson, about Billy Martin and Reggie Jackson. Maybe you know about how George Steinbrenner foolishly releasing Johnny Callison on a whim, or about Steve Dalkowski scaring the hell out of the Splendid Splinter. Maybe you’ve even heard about how Paul Waner was actually a better hitter when he was a little drunk, or of the impostor who kept Lou Gehrig’s consecutive games streak alive when he was laid up. But what do you really know? The very nature of “legends” is such that there’s almost always a grain or two of truth wrapped up in a fanciful, entertaining, but largely untrue tale. Rob Neyer (and a guest or two) help to investigate, and in many cases, de-bunk, some of the more famous legends and tall tales from the history of baseball. Rob doesn't get into legends about misdeeds off the field, sticking instead to the fun stuff, like who hit a game winning homer off of whom on which date, or whether or not an event had the life-changing impact that was claimed by certain players. And these, it turns out, are the best sorts of legends to investigate, because the eventual outcome of any investigation is mostly of academic and human interest, having no impact on either the law or the record books. Well, mostly. As is always the case with Neyer’s books, this one is eminently readable. Neyer’s prose is always solid, personable and fluid, with well chosen but not overly elegant words, and he makes no effort to impress you with his vocabulary. Some of the best writing in the book actually isn’t Neyer’s, but rather that of Scribbly Tate, who does the remarkably interesting chapter on the so-called impostor who replaced the ailing Iron Man to keep his 2,130-game streak alive. To be fair, though, this is more a credit to Tate’s unique written voice than it is a knock on Neyer, who’s no slouch as a writer himself. Neyer’s digressions are always interesting and well informed, and he rarely goes of on a Posnaskian tangent, though those can be fun, too. The chapters are brief, usually no more than three to six pages, so the book can be easily read in small chunks whenever you have a moment to spare. The main strength of the book, painstaking research, is also its one weakness. Or, if not a weakness, perhaps just a downside. The whole point in each chapter is to get at the truth behind the stories told by players, journalists and other baseball people, and that takes time and effort. Some of it could be done with Baseball-reference.com or Retrosheet, while other information had to be sought from the Hall of Fame archives or other out-of-print books. This is all fine, but in a few cases it seems that the research goes a little too deep, exploring things that are beyond the scope of a particular legend, just to make sure that no stone is left unturned. In a few cases, by the time we get to the bottom of the story, Neyer has nearly forgotten what he was looking up, and so we find him looking for a strikeout when the story referenced a pop-up, or getting the names mixed up a little. These are few and far between, but they’re there. The other downside to the painstaking research is, well, I’ll just say it: Most of the legends are not true. Almost every referenced story in the book is wrong in one or more detail, and most of them have either gotten various incidents mixed up with each other or are almost complete fabrications. If you’re ultimately looking for the truth, this is not a problem for you, but those of you who really like a good story, and want to keep believing in it, will have some of the wind taken out of your sails. Of course, you get warned about that right in the introduction, so if you’re upset about it, you’ve nobody to blame but yourself. In all, the book is really a tremendous amount of fun. Neyer has done all the dirty work for us, spending hours and hours poring over the internet, old books, and even (get this) something called "microfiche", which it turns out is how they used to store really old information before Al Gore invented the Internet. All the leg work is already done, so you can relax with the book and a beverage in the comforts of your own home instead of in front of a big, flat screen with crusty old knobs in some dusty old library. Not that there's anything wrong with libraries. So the next time a friend tries to tell you about how Fred Lynn always hit better against the good teams, or how Billy Martin turned the 1965 Twins into a running machine, or how Lou Boudreau turned Ron Santo from a nondescript catcher into the greatest thirdbaseman of the 1960’s, you can tell them they’re all wet. And better yet, if you hear or read a story that’s not in this book (and there’s no shortage of those) you have a framework for how to find out whether that one’s true or not, too. Finding out the truth of these matters, it turns out, is almost as interesting as the embellished story itself. Sometimes, even more so.